What is the Club Activ8 Scheme? The scheme is currently running at a number of schools within the District. Once on board young people at those schools will receive weekly points during term time based on the price of a Junior swim e.g. 27 points (£2.70). For those aged 14 plus, weekly points are currently based on entry to the fitness suite e.g. 41 points (£4.10). For those aged 16 plus, weekly points again based on entry to the fitness suite e.g. 67 points (£6.70). Extra points will be awarded at the schools discretion but usually include any extra sport activity that takes place at school e.g. lunchtime clubs, after school clubs and practices/matches. What can Club Activ8 points buy? 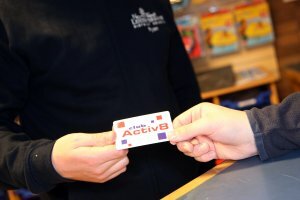 To use available points simply show the Club Activ8 card at chosen Leisure Centre Reception. They can also inform you how many points are available. Points are only valid for one school term and any not used are reset to zero at the start of the new school term. Part payment is not allowed for any activity and places on courses/classes are based on a first come basis. Once you have received a yellow form from one of the participating schools you can choose to join up be taking the form to Hood Park, Hermitage, Ibstock or Measham Leisure Centres or alternatively complete the on-line form making sure you include the card number you have been supplied with. Please pick either the Hood Park or Hermitage page and your details will be sent to that leisure centre to be entered onto the system. Please allow 7 days for on-line join.